There's a lot more capital that should be going to startups. So says Silicon Valley venture capitalist Marc Andreessen, who made the case that much more money could be flowing into private tech firms. 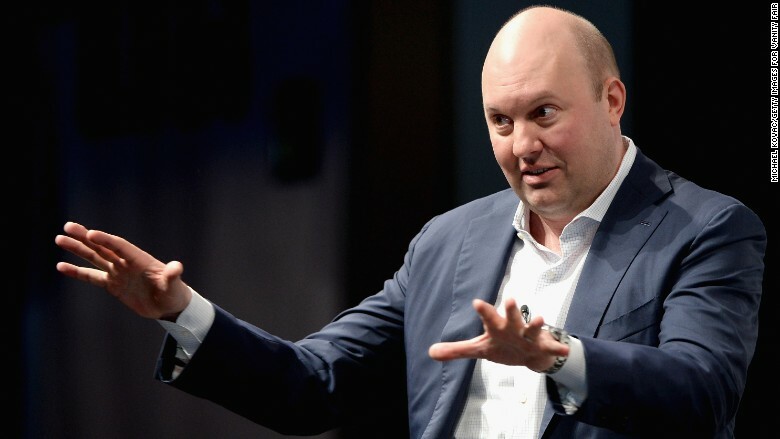 "The critical crisis for the economy at large isn't that unicorns are overvalued ... it's that there aren't enough unicorns," Andreessen said on stage Wednesday at the Startup Grind Global Conference. "Unicorn" is the term for privately held companies valued at $1 billion or more. Once considered a rarity, there are now more than 140 of them. Many aren't generating revenue, and some, like Box (BOX), have gone public at lower valuations than what they were worth as a private company. Andreessen -- a backer of high-profile firms like Facebook (FB) and Twitter (TWTR) -- said $50 billion is going into private companies each year. He said that's actually not very much, in the grander scheme of things. "It's a large amount of money from an absolute standpoint ... but it's a very, very small amount of money from a global context," said Andreessen. In 2015, S&P companies were expected to generate $1 trillion in dividends and stock buybacks. "The real question is what happens to the $950 billion that doesn't [go into startups]?" Andreessen asked. Andreessen said, overall, big companies don't aggressively invest in the future, which is why they're getting edged out by newer technologies. But he emphasized that it's also happening to Silicon Valley startups, which have about five years before they're disrupted themselves. One example is Twitter, said Andreessen, adding that after 10 years in business, it's having to compete with platforms like Instagram and Snapchat. "They're in the middle of trying to figure it out," he said. "The person with the best odds of countering disruptions is the founder," he said, noting that there's no such thing as being too aggressive. "There is someone who has been criticized for being too aggressive, his name is Mark Zuckerberg ... there is a real art form and a real science in building these kinds of companies," he said. "This is a business for the aggressive." He also declined to comment on the recent controversy surrounding Zenefits, one of the unicorns that he backs. Zenefits CEO and founder Parker Conrad abruptly stepped down earlier this month, and the firm is currently being investigated by California regulators.